Mexico Adventure has been online since 1999. Their focus for the past 10 years was on Mexican retirement destinations. They specialize in booking on-line reservations for Mexican Resorts and all inclusive Mexican destinations. Mexico Adventure saw an opportunity to capitalize on Mexico travel and Mexico tourism by re-branding their look and feel. Lurus was hired to completely redesign the website and integration an online booking engine that would enable them to book reservations anywhere in Mexico. Rather than concentrate on the retirement travel sector, Lurus helped Mexico Adventure expand into the entire tourism industry available in Mexico. 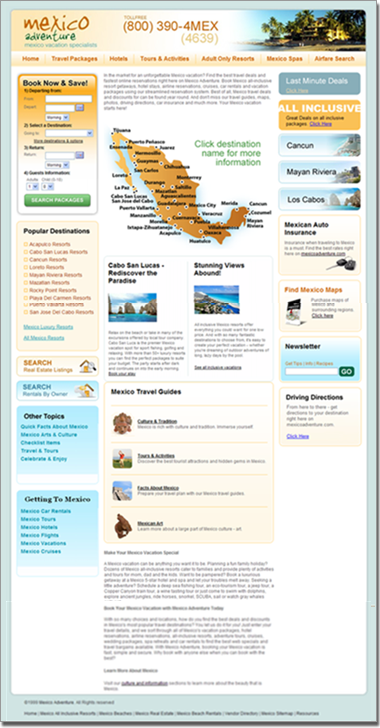 A custom online rentals by owner directory was also built for Mexico Adventure which allows vacation rental owners to list their properties on this site for a small fee. Mexico Adventure is quickly becoming a leader in Mexico travel. They have been able to integrate booking engines from many of the major booking providers in the industry. They now represent over 400 hotels in Mexico with the ability to book every hotel directly through their website.